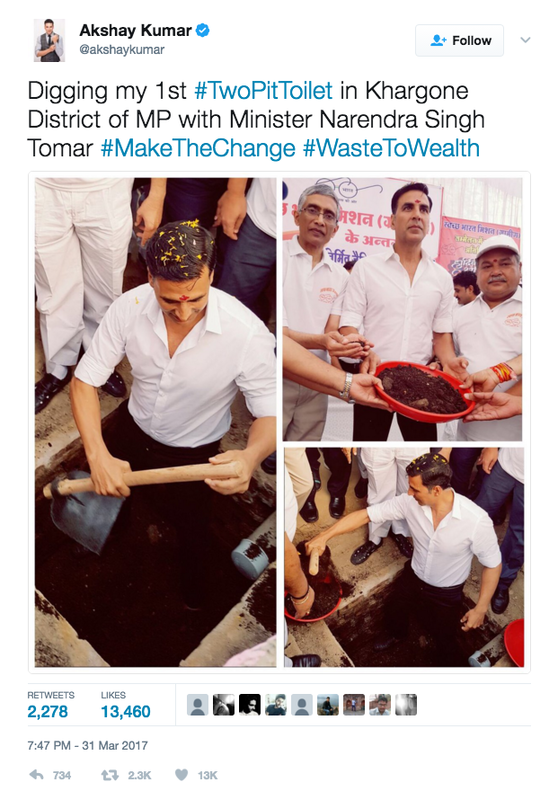 Home BOLLYWOOD Akshay Kumar Digs A Toilet In Public! The Bollywood star Akshay Kumar is coming up with his new movie, ‘Toilet Ek Prem Katha’, and its first poster is out. The former star is going out of league to promote the movie and he is brawny as ever. ‘Toilet Ek Prem Katha’, is directed by Shree Narayan Singh, starring Akshay Kumar, Sana Khan, Anupam Kher and Bhumi Pednekar. It is set to release on August 11, 2017. The actor, as he was in Madhya Pradesh did this activity in a district named, Khargone. The movie revolves around Swach Bharat Abhiyaan and we think this is the best way to promote a movie. It is innovative, different and luckily is practically possible too. Now, the lastest update regarding this movie is that it is going to clash with Shah Rukh Khan’s, ‘Kabil.’ Both of them are ready to release their movies in the Independence – week of this year. Now, is the reason why Akshay Kumar got on streets to promote his movie? Or he is just too dedicated for the same? Stay in touch with BusinessofCinema to know further. Previous articleWatch: Bharti Singh INSULTS Manveer Gurjar And Manu Punjabi In The Most HILARIOUS Way!